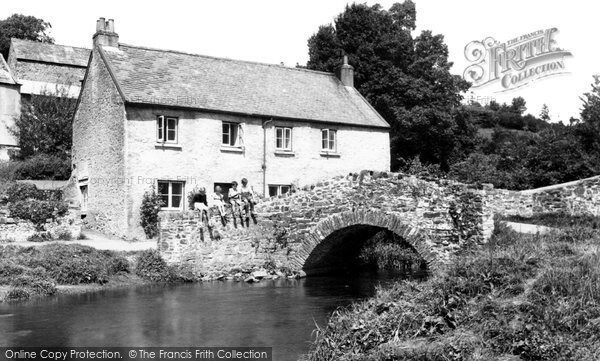 Happy Days At Mill Bridge - a Memory of Bishop's Tawton. Hi to anyone looking at this photo, I lived just up the road at Valley Cottages and used to play by the bridge, we all sat on the bridge wall and had our photograph taken. I am on the right with wellington boots on, and my sister Jean is on the far left. The girl beside her is Ursula Edwards and the boy beside me is Colin Hutchings. I remember a Mr Handcock living in the cottage on the right and a Miss or Mrs Day living in the cottage on the left. I have a picture postcard of this photo which was posted to my auntie in Preston in Lancashire, which years later she gave back to my mum who then gave it to me. The postcard has a 3d stamp on it which is franked by the Post Office with date of 18th Sept 1958. A memory shared by Mr. John Salisbury on Nov 15th, 2008. Send Mr. John Salisbury a message. Add a memory of Bishop's Tawton.